Really, this beginning is a pretty accurate portrayal of what to expect throughout the entire screen time thus far, as Saekano manages to be one of the more amusing series I've seen due to constant self-depreciating humor. Throughout the show, generic scenes present themselves that normally would add up into an unoriginal rom-com. However, by taking these and spinning them into critiques of the present tropes themselves, it introduces an extra element of hilarity that pushes Saekano into the upper tier of this season's shows. Make no mistake: Saekano is not just hilarious when it is self-aware. The moment when Tomoya is told by Megumi (who has an interesting habit of being extremely blunt) that he is one of the biggest 'celebrities' in school because of his sheer level of otaku-ness was priceless, and many other similarly amusing scenes have presented themselves the past few weeks. The characters themselves, while not always being completely original, manage to take advantage of the show's relatively unique premise. Megumi, Tomoya's 'heroine', ironically has no presence and because of this he never even realized they were in the same class. Eriri, the artistic member of the group, maintains a pristine school appearance while secretly being a 18+ doujin artist (and a HUGE tsundere towards someone that she appears to look down on at school :P). The interactions between each member of Tomoya's assembled team play off these traits, and fit really well together. 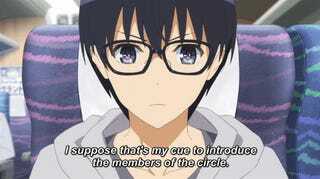 While Saekano follows many common anime tropes, it has managed to be amusing through its clever character interactions and intense self-awareness. So far it has proven to be a solid watch every week, and hopefully will continue to do so. In case any of you were wondering, Eriri is my favorite character thus far, although I kind of love them all. Saekano: How to Raise a Boring Girlfriend is currently available for free and legal streaming on Crunchyroll, with a new episode every Thursday.